There’s a moment’s calm as you find your balance and lift your head, gazing out over the palmtree skyline. A small fleet of brightly coloured sailboats sweep past and the enthusiastic melody of an aqua aerobics class wafts by on an ocean breeze. Club Med Kani is buzzing with activity, but you’re falling forward now as the the high powered jets shooting from your heels send you headlong back down into the blue. Your first flyboarding lesson will require more concentration than that! (And it’s surprisingly tough on the knees). Simple to learn but difficult to master, for half an hour you’re part Tony Hawks, part Tony Stark. Watching a demonstration afterwards of how it should be done makes the experience seem only more surreal, like superhero training in the middle of the Indian Ocean. But the reality of life in Club Med Kani is not like most resorts in the Maldives. Those who travel the 20 minute speed boat ride from the international airport will find an island of activity in the relaxing surrounds of North Male Atoll. 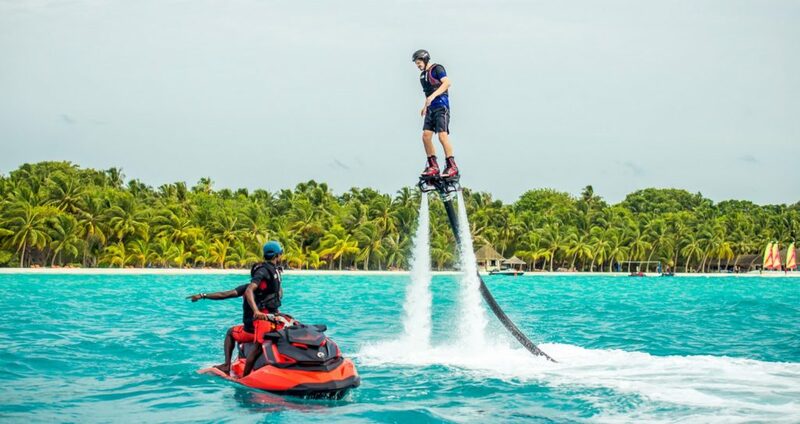 As well as hydro-powered flight, guests are invited to learn the special powers of cookery, dancing, sailing, windsurfing and even massage (all essential for Club Med superheroes). 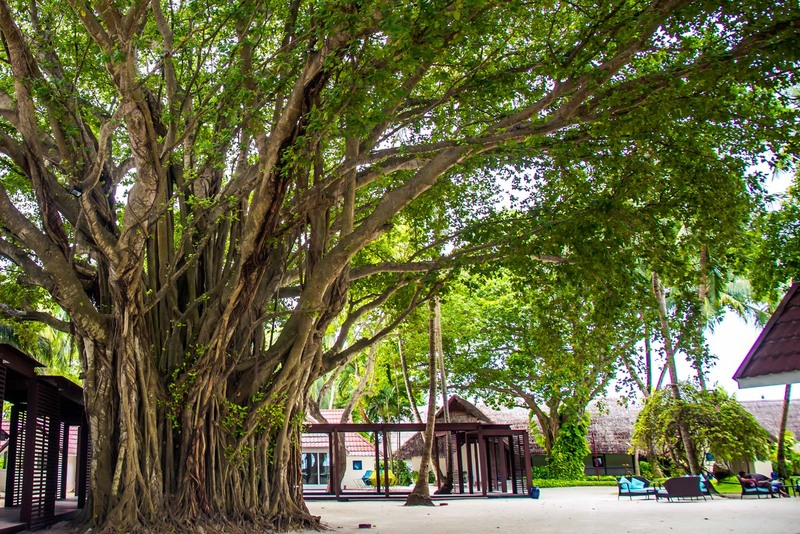 Kani’s racing heart is situated at the huge banyan tree in the centre of the island. Benches and sofas offer a moment to pause as the open area transforms daily from open air gym, nighttime cinema, dancehall and local market. Surrounding these activities are the main bars and dining areas, which combine to provide a 24 hour menu to fuel the fun. 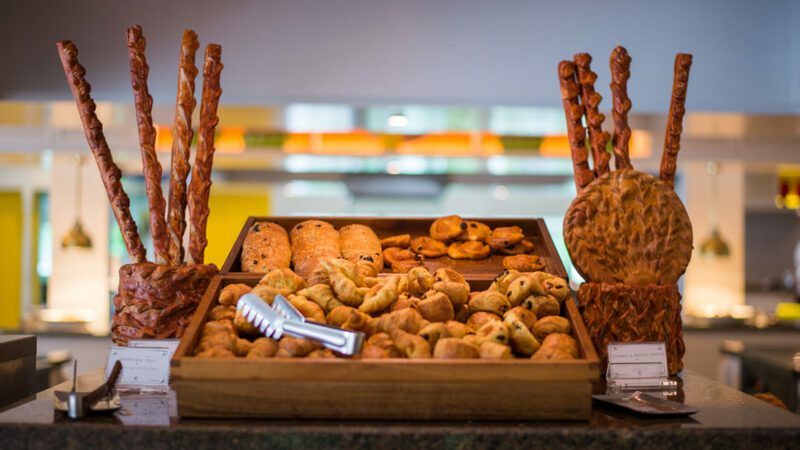 The main buffet is an activity all of its own, with an overwhelming array of cooking stations making the restaurant relay a popular activity. (Banana pancakes, a hotdog and ice cream are okay for lunch if you have a strenuous afternoon ahead). 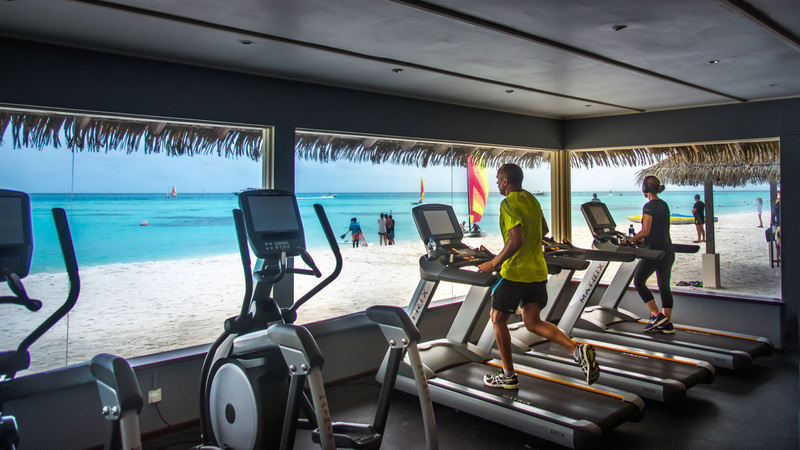 The pristine beach stretches the length of the 1km shore, decorated with jetskis, catamaran, and various games courts – all of which can be viewed from the treadmill in the gym. Rows of cheerful rooms sit further back, while water villas reach out over the reef further along. For the dedicated, daily sports tournaments can be part of the fun-training as can aerobics, pilates, yoga, kayaking, fishing, snorkeling, and surfing; so doing some smile study is recommended before you arrive. As the sun begins to set and guests warm down after another day of tough fun, Kani’s multinational team of staff are just getting started. It’s showtime at 9pm each night, with high energy song and dance performances in the island’s own theatre. A re-enactment of Grease featuring 24 different nationalities – including a Mexican Danny and Thai Sandy – is not something you’ll see anywhere else, and there’s a different show every night. You can pass on your compliments to the multi-talented (and multi-lingual) performers as they mingle and dine with the guests throughout the days. Situated just a short speed boat from Kani is its sister resort, Club Med Finolhu Villas. Younger, more elegant, and with a taste for the high life. 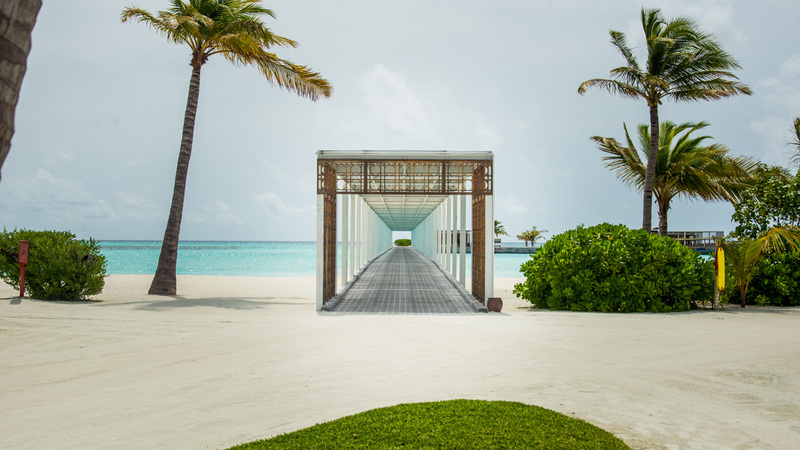 Billed as the Maldives’ first solar-powered resort, guests at Finolhu Villas are immediately met by the unique solar panelled jetty, leading to the peaceful and leafy island. 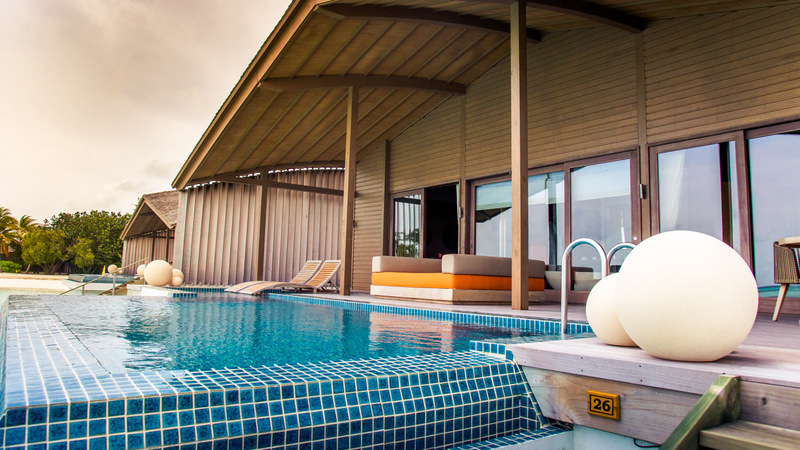 After the rocket men and zumba people on Kani, Finolhu feels a world away – an island designed for privacy with state-of-the-art villas. Bluetooth, butlers, infinity pools and touchscreens. You know you’re reaching the peak of luxury when needs are being met that you didn’t even know you had. Breathtaking architecture in the high-ceilinged bar and restaurant encourages a horizontal outlook, as do while the over-water spa treatments. Guests from Kani can take day trips to Finolhu, while those from Finolhu can take a break from the exhausting decadence to join the fun over on Kani whenever they wish. And why be bored when you can flyboard? From a distance, Club Med Kani Resort emerges like a garden island, bathed in turquoise waters. This little paradise in the Maldives archipelago, exclusively reserved from Club Med resort guests, is dotted with 75 suites on stilts which, viewed from above, resemble a giant palm tree growing out across the lagoon. At the heart of a luxuriant natural world surrounded by multicoloured birds, the rooms offer personalised services for demanding Robinson Crusoes. Between diving in the underwater depths and the pleasure of sampling the exquisite flavours of Asia, Kani is an Eden for all lovers.